Manure, bedding and animal mortalities are among the farm-generated organic residuals that can be managed through composting. Go to the Large Scale Composting section to view materials on siting, operation and management of farm manure composting facilities. 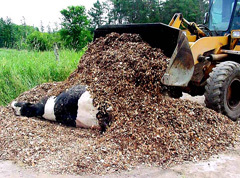 Go to the Mortality Composting section to view materials on siting and operation of farm manure management composting facilities. Resources addressing horse manure composting, planning composting systems on dairy farms, economics of farm waste management, agricultural plastics. Dairy Manure Solids Cut Bedding Costs. Article published in Northeast DairyBusiness 10(4):24-25, 2008. Manure Solids for Bedding. Article published in Northeast DairyBusiness online, 2008. Frequency of Re-Bedding With Dairy Manure Solids. Results. 63p, 2008. Using Manure Solids as Bedding. Final report. 128p, 2008. Health Impacts and Economics of Using Dried Manure Solids in the Northeast - Proceedings from the Ninth Annual Fall Dairy Conference, 2008. Save Money on Bedding. Article published in Eastern DairyBusiness 1(4):21, 2009. Case Study - Eagleview Compost Dairy Barn. 12p final report of the Evaluation of a New Compost Dairy Barn Facility in New York State. 2009. Are Solids A Solid Bedding? Article published in Hoard's Dairyman, 154(14):518. 2009. Use of Dried Manure Solids as Bedding For Dairy Cows.10p document resulting from research conducted on farms using DMS bedding to determine the feasibility of using manure solids as dairy cow bedding. 2010. How Frequently Should Stalls Be Refreshed With New Bedding? Article published in Progressive Dairyman, 1:57-58, 2011. Co-Composter - A Planning Tool to Determine the Space it Takes to Compost. An Excel spreadsheet model. How Mycobacterium avium paratuberculosis is Affected by the Composting Process. Trends in Animal & Veterinary Sciences Journal 2(1):5-10. 2011. Go to the Large Scale Composting section of the Composting page to view materials on siting, operation and management of farm mortality composting facilities. Considerations for Dairy Farms Regarding Use of Sewage Sludges, Sludge Products and Septage. 23p document (6p summary), by 7 Cornell faculty and Extension educators. 2003. Septage Quality and its Effect on Field Life for Land Applications. 11p article published in the Journal of the American Water Resources Association 39(1):87-97. 2003. Agricultural Plastics - Boon or Bane? An agricultural waste market research study for NYS. 1997. Evaluation of Solids and Liquids from Anaerobic Digesters for Use as Bedding and Fertilizer. NYS DEC final report. 54p. 2016. Farm-Based Composting: Manure and More. 38-minute video highlighting 15 farm operations and six different composting technologies. YouTube. 2001. Farm Waste Management Makes Sense. 9-minute video provides an overview of serious economic questions surrounding agricultural waste disposal and offers suggestions for effective waste management. 1996.